All of the calculations and results in this report are preliminary and intended for the purpose, and only for the purpose, of aiding the incident team in assessing the extent of the spilled oil for ongoing response efforts. Other applications of this report are not authorized and are not considered valid. Because of time constraints and limitations of data available to the experts, many of their estimates are approximate, are subject to revision, and certainly should not be used as the Federal Government’s final values for assessing volume of the spill or its impact to the environment or to coastal communities. Each expert that contributed to this report reserves the right to alter his conclusions based upon further analysis or additional information. An estimated minimum total oil discharge was determined by calculations of oil volumes measured as of May 17, 2010. This included oil on the ocean surface measured with satellite and airborne images and with spectroscopic data (129,000 barrels to 246,000 barrels using less and more aggressive assumptions, respectively), oil skimmed off the surface (23,500 barrels from U.S. Coast Guard [USCG] estimates), oil burned off the surface (11,500 barrels from USCG estimates), dispersed subsea oil (67,000 to 114,000 barrels), and oil evaporated or dissolved (109,000 to 185,000 barrels). Sedimentation (oil captured from Mississippi River silt and deposited on the ocean bottom), biodegradation, and other processes may indicate significant oil volumes beyond our analyses, as will any subsurface volumes such as suspended tar balls or other emulsions that are not included in our estimates. The lower bounds of total measured volumes are estimated to be within the range of 340,000 to 580,000 barrels as of May 17, 2010, for an estimated average minimum discharge rate of 12,500 to 21,500 barrels per day for 27 days from April 20 to May 17, 2010. 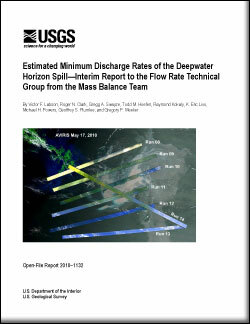 Labson, V.F., Clark, R.N., Swayze, G.A., Hoefen, T.M., Kokaly, Raymond., Livo, K.E., Powers, M.H., Plumlee, G.S., and Meeker, G.P., 2010, Estimated minimum discharge rates of the Deepwater Horizon spill—Interim report to the Flow Rate Technical Group from the Mass Balance Team: U.S. Geological Survey Open-File Report 2010–1132, 4 p.